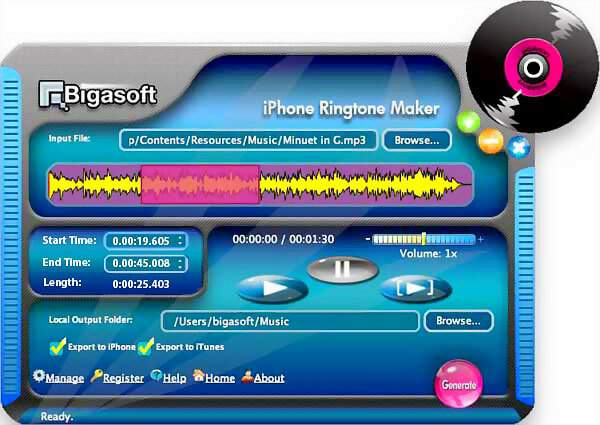 Bigasoft iPhone Ringtone Maker is an easy-to-use iPhone ringtone creator which helps you easily convert music like MP3 to iPhone ringtone M4R, even create iPhone ringtone M4R from your personal music/movie collection including WMA, APE, M4A, WAV, MP3, RA, AVI, MPEG, WMV, DivX, MP4, H.264/AVC, AVCHD, MKV, RM, MOV, XviD, 3GP, WebM and so on, and transfer the created ringtone to iPhone via USB cable for you automatically. Bigasoft iPhone Ringtone Maker can help you clip any music and video segment you like as your unique iPhone ringtone. You can assign a specific iPhone ringtone to individual contacts in your iPhone, or choose the new made iPhone ringtone to play as an alarm. Any music file you love can be converted to ringtone for iPhone due to the support for a wide range of music formats like APE, MP3, WMA, WAV, M4A, etc. The ultimate ringtone creator automatically transfers your own ringtones to your iPhone such that you can hear these fantastic ringtones when your acquaintances call you. You can reduce or increase iPhone ringtone volume for hearing phone ring wherever you stay in a quiet room or in a noisy environment. It can take music longer than 30-second as ringtone; moreover, it can take the whole song as ringtone also. Graphical display of music files to help you set exact start and end time of the segment to hundredth of a second. Listen the iPhone ringtone before conversion and transfer to iPhone via USB cable, save your time. Provides chooses including English, German, French, Spanish, Japanese, Arabic, Italian and Chinese. 2010.08.09 Bigasoft supported converting WebM and VP8 to iPhone ringtone in version 1.7.9.3873. Sys requirements: CPU >1GHz Intel or AMD CPU. 512 MB RAM or above. Bigasoft iPhone Ringtone Maker helps you easily convert music like MP3 to iPhone ringtone M4R, even make custom iPhone ringtone from your personal music/movie collection, and transfer the new created ringtone to iPhone via USB cable automatically. Oxygen Phone Manager empowers all Nokia owners with a unique combination of features to manage the content and settings of a cellphone from a PC. You can organize your phonebook, events and tasks, gallery, send or receive SMS and MMS and much more.